The hare thinks his special talents will help him accept the king’s challenge. The fox, the leopard, and the elephant present themselves to win the challenge. But lo and behold, to the amusement of the king and the notables, all of the contenders fail. Despite all odds the tortoise comes forward for the task. Will he be able to achieve the impossible challenge that has stumped those far bigger and mightier and most swift? 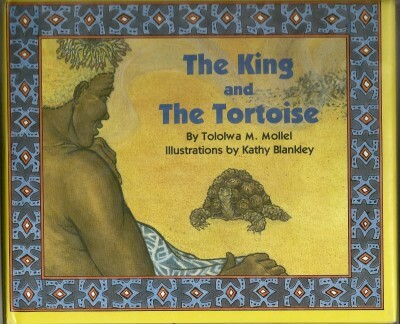 Tololwa Mollel’s witty retelling of this tale from Cameroon comes to life in Kathy Blankley’s illustrations, complete with borders in traditional Cameroon design. The King and the Tortoise has been translated into several Southern African languages: Zulu, Xhosa, and Afrikaans. “No one in my kingdom is cleverer than I am!” he said. “But if you think you are, you must prove it. Your task is to make me a robe of smoke.